Dr. Lauren E. Gebauer is a board-certified dermatologist and fellowship-trained dermatologic surgeon specializing in Mohs Micrographic Surgery. Dr. Gebauer, originally from Columbus, Ohio, attended the University of Notre Dame where she walked onto the Women’s Golf team earning four varsity letters and two academic All-American awards. Following college, Dr. Gebauer enrolled at the University of Cincinnati College of Medicine where she graduated with honors including membership in the prestigious Alpha Omega Alpha Society. 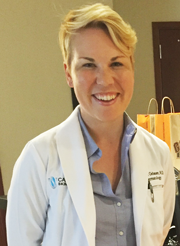 Following medical school, Dr. Gebauer stayed at the University of Cincinnati to complete her general dermatology residency training where she was elected Chief Resident during her final year. After graduation she was offered a competitive Mohs Micrographic Surgery fellowship under the tutelage of Dr. Hugh M. Gloster, Jr. Since completing her fellowship, Dr. Gebauer has completed over 4,500 Mohs cases and complex reconstructions. Although direct patient care remains her primary focus, Dr. Lauren Gebauer strives to improve skin cancer awareness in the public. She volunteers with the SF Giants to do skin cancer screenings, and has published numerous academic journal articles and book chapters. Most recently, she co-authored a review book: “Absolute Dermatology Review—Mastering clinical conditions on the Dermatology Recertification Exam”. Outside of the office, Dr. Gebauer enjoys exploring new restaurants, golfing, walking her dogs Porcini and Olive, and spending time with friends and family.